Dear DKU MMS students: As you prepare to travel to the other side of the globe in these coming weeks, know that you go with our best wishes for continued success and much happiness in your adventure ahead. In The Contest of the Century, Geoff Dyer, a journalist for the Financial Times, argues that China is abandoning its geopolitical strategy of self-restraint and is pursuing an ambitious new agenda to shape the world according to its own interests. The emerging struggle for influence and power between the two dominant nations in the world, China and the United States, is based on balance of power issues, such as military dominance in Asia, as well as practical tactics that promote Chinese economic growth, such as replacing the U.S. dollar as the global currency. Dyer explains that the U.S. followed the same steps more than a century ago at a similar stage in its economic development. America developed naval power to strengthen its own security and to protect its overseas interests; At the same time, the nation created the financial infrastructure needed to replace the British pound as the international currency. But the outcome of today’s rivalry is not inevitable. The U.S. is still strong and predictions of its demise are premature — provided the nation gets its deficits under control. In another new and remarkable book, Can China Lead?, faculty members from Harvard (Kirby and McFarlan) and Wharton (Abrami) discuss the economic competition between the two superpowers, China and the United States. The authors describe China as a nation whose economic miracle has been powered by state infrastructure projects, but whose private sector has been constrained by poor governance. China is controlled by an elite group of Chinese Communist Party members who obstruct the changes necessary to transform the country into a sustainable economic powerhouse. Challenges to transforming China from an infrastructure state to a consumer economy are significant. The lack of transparency and accountability of the Communist Party and the absence of rule by law impedes risk taking by entrepreneurs. Intellectual property theft limits research and development in the private sector. While the standard of living in China has risen sharply in recent decades, the benefits have been uneven, resulting in a perilous level of income inequality. Clean air and water are in short supply, leading to social tension. Resolving these problems will require those in command, the Chinese Communist Party, to share power and to cede more control to market forces, something they are unlikely to do peacefully. 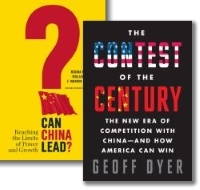 Both books are recommended for readers who want a deeper understanding of the world’s new dominant economy, as well as international managers developing a strategy for expanding into China. Kay, Katty and Claire Shipman. The confidence code : the science and art of self-assurance–what women should know. HarperBusiness, 2014. Two national news journalists show that confidence is more important to success than competence. Partly genetic, confidence is inborn and some people naturally have more of it than others. But with effort, confidence can be learned and expanded, through habits such as doing more and thinking less. Also available as an online audiobook. Mohr, Tara. Playing big : find your voice, your mission, your message. Gotham Books, 2014. Leadership coach Tara Mohr offers her own leadership strategies for increasing confidence in women. She recommends listening to one’s own inner mentor instead of her inner critic, interpreting feedback impersonally, and making experimental leaps into action. Also available as an audiobook on CD. McGonigal, Kelly. The willpower instinct : how self-control works, why it matters, and what you can do to get more of it. Avery, 2012. Psychologist Kelly McGonigal, teaches a ten-week course at Stanford on willpower. Students enroll in her class to get more control over their thoughts and emotions so they can achieve their professional goals and improve their relationships. McGonigal presents strategies and exercises for developing self-control, training the brain for willpower.